All our tool sets are developed in conjunction with wargamers nationally, covering most of the popular games being played, these unique measuring sets have proved popular with both club and tournament players here in the UK and internationally. 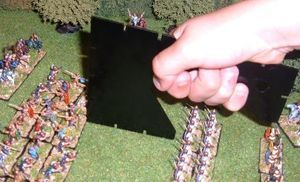 They even seem to have made it into the diagrams and pictures used in the 'Field of Glory' rule sets. Hurrah!! Also, we are pleased to release our new set of tools for Simon Hall's Mortem et Gloriam rule set (launched in July 2016). These sets are manufactured from high specification brass rod: making them truly rust free and lasting a lifetime! Produced in modern engineering facilities, to strict tolerances, their accuracy is guaranteed!. Each rod is cut to length (Metric or Imperial) and the key measurement distances are highlighted for each tool. The easily identify the movement or shooting distance required, an attractive 'ring and knurl' feature has been applied so that each tool proves to be a durable asset on the table top. Either planning, or re-planning those key moves and actions! All measuring tool sets are supplied with an attractive and practical presentation case that facilitates storage and portability to the club or events. We are delighted to say that may of our sets have proved to be an ideal gift or presentation piece for discerning wargamers, club competitions and wargaming companions!! Listed below is our current range of calibrated measuring tools covering DBA, DBM, DBMM, L'Art de la Guerre, Field of Glory, Saga and now for the new Mortem et Gloriam set. Please see below for current prices and specific configurations. Postage and packaging rates, plus PayPal discounts available, are also shown at the bottom of this page. 'Mortem et Gloriam' rules set: for 15mm table top games. This is a 6 piece set (see image above) comprising 5 individual brass measuring tools: 'ringed and knurled' in the 40mm increments (base widths) necessary to play the game. They are 80, 120, 160, 200 and 240mm. To enhance the set further we have added one 40mm x 40mm brass handled positioning tool made from 20 gauge galvanized steel which has been primed and enameled matt black as per usual standard. We include, as standard, a Mortem et Gloriam 10" presentation case (Royal Purple with gold flocking*) to make this an ideal gift. Go to http://www.thewargameszone.org/ for more information on Simon's Rules. 'L'Art de la Guerre' Playing Set. 15mm scale. 'L'Art de la Guerre' rules set: for 15mm table top games. This is an 7 piece set (see image above) comprising 5 individual brass measuring tools 'ringed and knurled' in the 40mm increments necessary to play the game: 80, 120, 160, 200 and 240mm. To enhance the set further we have added one 40mm x 40mm brass handled positioning tool and one AdG Camp Base (measuring 40mm x 80mm). Both extra items are made from 20 gauge galvanized steel. Finally, we include as standard a black, with gold flocking 10" presentation case* to make this an ideal gift item. Celebrate and treat yourself to a set for the new Field of Glory V3 release ! Our renowned "tournament standard" measuring tool set. 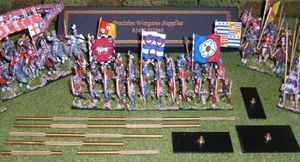 This set is designed specifically for the 15mm Field of Glory games Ancient & Medieval or Renaissance periods. Each set comprises (see image above) 6 measuring tools (2", 3", 4", 5", 6" and 7") plus four of our handy 40mm brass handled positioning tools. Made from solid brass rod, each measuring tool is calibrated to 1 inch increments. Each individual set is precision machined to length and features our unique "ringed and knurled" effect to mark the 'MU's on each tool required to facilitate quick play. Suitable for the 15mm or 25mm game. Other Sets in our "Classic" Range of PWS Ltd Measuring Tools. HCD-01. Four sided measure featuring all the key wargame distances all in one tool: 2", 3", 4", 6". * Style and base colour of presentation case may change depending on availability. Otherwise, please make cheques payable to I M Carbutt or use SWIFT bank transfer and please allow 28 days for delivery. For postage and packaging in UK please add +12%: minimum £3.49. For overseas order please add Europe: 25%: min £5.99. RoW 45% min £12.99.